"I once spent decades faithfully cataloguing all the locations, every visit from the smallest camera angle to the largest zoom. But no sooner had I finished when it all started changing - new series, new filming, locations running amuck ... I had to start amending my entries - oh the task is endless!" Welcome to the Locations Guide, a website devoted to the filming of the classic and new television series Doctor Who, and spin-offs such as Torchwood and The Sarah Jane Adventures. This site is designed to be a guide to the many locations around the UK and the world which have been used for the filming of the series, providing details on how they were used within the shows, where to find them, and a comparison between how they look in the modern day to their original appearance on screen. Our aim is to maintain an up-to-date database of locations and how they change over time, which means that unlike printed publications we can reflect alterations, demolition or name changes as they occur. However, being that there are some 1327 locations in the database, this might be a never-ending task! This means we depend on you! We hope to provide a community for location-seekers in order for them to organise trips to places themselves, and to provide feedback on what they find. Please send us any news, updates, and photo submissions for locations; we're also interested in filming reports, and also photos portraying places at the time of filming or or in subsequent years before they were altered/demolished. Please note that this is a fan-run site, and is not directly connected to either the BBC or the production of Doctor Who! As of 12th January there are 4303 photos submitted, covering 924 out of the 1327 known locations listed on site. The next series of Doctor Who is due to start filming from the 20th February, with rehearsals from next week. As always we would like to hear from anybody who catches filming out and about in Wales (and wherever else they might end up going to! ), and photos that can be added to the filming archive. Please feel free to contact us on filming@doctorwholocations.net. You can also follow filming updates on Twitter via @drwhofilming, and also on Facebook. There have been a number of filming roundups that have been published via the Doctor Who News site, summarising how filming has progressed this year. The new series of Torchwood, Miracle Day, has now begun shooting in Los Angeles. However, film reports are likely to be thin on the ground due to the tighter security employed by American production crews. There's more hope for the filming when it returns to the UK at the end of the month. Meanwhile, some tidbits from filming can be read on Twitter via the BBC's official feed covering the shoot, @BBC_Torchwood. Archive photos for locations are now previewed when you hover the cursor over the « and » buttons. 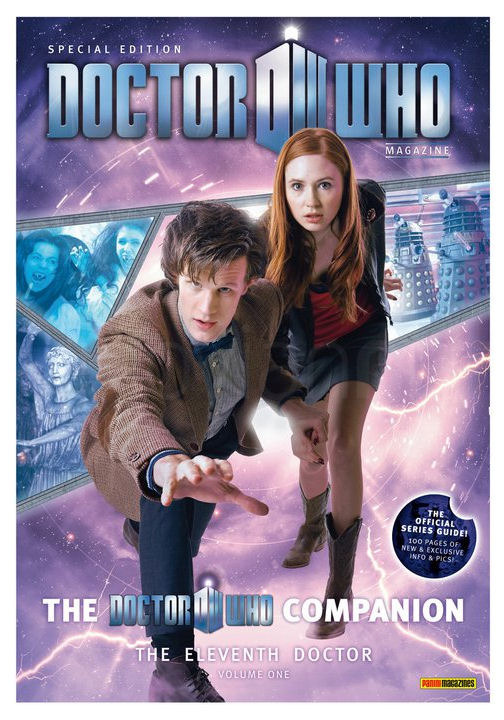 The next volume in the in-depth production of the new series of Doctor Who arrives today in the form of Volume One of the Eleventh Doctor. As we've come to expect, the volume contains the usual wealth of information on the production of the series, and of course from our perspective the whens and wheres of filming during the course of production. This volume covers the first six episodes from The Eleventh Hour through to The Vampires of Venice - we'll have to wait until the 30th December for the other half of the series! The volume is laid out in the way we've come to expect, though there seem to be a lot more photos in this volume than previously (which one suspects helps bump the page-count to 100 for just six episodes! ), plus an introduction, Just like starting over, covering Matt's arrival into the role. filming details19th July 2010 - And we're off! Series Six of the modern Doctor Who as begun in earnest today with film preparations taking place at the The Coal Exchange in Cardiff ready for filming later today. A BBC press release last week indicated that work was commencing on the Christmas Special. Every year has seen an exponential growth in interest and coverage of filming, and social tool Twitter is currently the 'weapon' of choice! We have Twitter feeds you can follow for general Doctor Who Location details and also for specific filming observations (i.e. spoilers! ); we also provide an rss feed for both drwholocations and drwhofilming respectively. There is also a new feature to allow you to see many Twitter related posts as they occur on our website, or you could choose to follow them on our newsfeed instead - don't forget these will contain spoiler! location updates24th June 2010 - Construction/Destruction! Basic building work is due for delivery from the developer in summer 2011. Once the studios, offices and external filming lots are fully fitted out, filming will begin for Casualty and Pobol y Cwm in autumn 2011, with Doctor Who and The Sarah Jane Adventures moving from their current Upper Boat studios in 2012. The first episode of Casualty to be made in Wales will be on screens in early 2012. The press release suggests that, as well as the forthcoming series six, series seven would also continue to be filmed at the current Upper Boat Studios, assuming the schedule follows the pattern of previous years (i.e. from Summer 2011 to Spring 2012). Meanwhile, demolition has commenced on the BBC (Victoria Road) premises, originally built on the site of TCC Condensers (seen in stories like The Invasion and Spearhead from Space) and subsequently used as rehearsal rooms in the production of many other classic Doctor Who stories. It is believed that the site will be developed into flats - a fate already received by the former BBC Visual Effects Unit site (now KJP Trading) nearby!. It has also been reported that the building that was once home to Shawcraft Models in Uxbridge is also threatened with demolition. Shawcraft built many specialist props for the early seasons of Doctor Who, most notably remembered for the original Daleks (you can find out more about the company in a feature on the Doctor Who DVD release of The Space Museum/The Chase). Even after it sells Television Centre, which it wants to do by 2013, the BBC hopes the building will 'live on' as part of a new creative hub in west London, chief operating officer Caroline Thomson has declared. The listed landmark, which is about to celebrate its 50th anniversary, could form the centrepiece of a community of media organisations, performing arts groups, facility providers and even fashion houses, Thomson told a conference hosted by the BBC in White City today. 'Our vision is to turn this area (W12) into a global centre for London's creative industries with the BBC at its heart,' she said. 'In doing so, we shall be shaping an entire community, replacing the buzz of Television Centre with the buzz of an entire neighbourhood. The Billy Banks Estate in Penarth is finally being demolished from today, with the flats off Royal Close by Paget Road being the first consigned to the dust pile. The estate has long been derelict and due for demolition, and the work is expected to take some 20 weeks to complete (at this time Chichester Road still stands, but for how long?). You can watch a video of the demolition from BBC Wales Today. London-based company Brit Movie Tours are running several tours of Cardiff locations over the course of the summer, including a visit to the Cardiff Doctor Who Exhibition. For more details and prices visit the Doctor Who tour section on their website.